Consumers’ confidence is the highest in the past decade; Facebook apologizes the users concerning the Truong Sa, Hoang Sa Map; a 40°C heat wave lasts for the whole week are among the most outstanding information in the week. General Secretary of the Lao People’s Revolutionary Party, President of the Lao People’s Democratic Republic Buonnhang Vorachith and his wife together with the senior Party and State delegation of Laos has paid a visit to Vietnam on July 3-7 at the invitation of General Secretary Nguyen Phu Trong and his wife, President Tran Dai Quang and his wife. During the visit, General Secretary, President of Laos Buonnhang Vorachith has held talks with General Secretary Nguyen Phu Trong and has held talks and had the audience with President Tran Dai Quang, Prime Minister Nguyen Xuan Phuc and Chairwoman of the National Assembly Nguyen Thi Kim Ngan. At these contacts, in an atmosphere richly imbued with friendship and mutual trust, the two sides continue to affirm and stress the importance and strategic significance of the traditional friendly relationship, special solidarity and comprehensive cooperation of Vietnam and Laos. The two sides have also unanimously agreed to the policies and measures aimed at taking the relations between the two Parties, two States and people of the two countries to the ever more intensive and extensive, substantial and effective development in all fields, thus making a contribution to successfully implementing the renovation line of each Party and the development strategy of each country on the basis of independence, sovereignty, equal cooperation of mutual interests and mutual assistance. A grand banquet in honor of General Secretary, President Buonnhang Vorachith and his wife and the members of the senior Lao delegation has been organized by General Secretary Nguyen Phu Trong and his wife./. On July 2, 2018, Prime Minister Nguyen Xuan Phuc held an on-line meeting with localities. 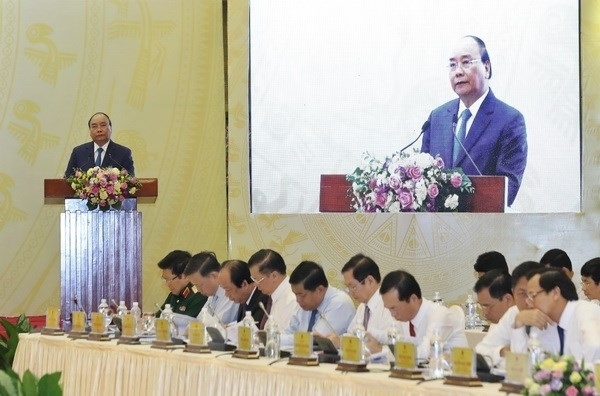 Speaking at the meeting, Prime Minister Nguyen Xuan Phuc warned: “Inertia of the reform has appeared and become ever bigger; so let’s stop the state that nothing doing is all right or things well done is all right. The state of indifference and irresponsibility of cadres is intolerable”. The Prime Minister assessed the positive social and economic results in the first 6 months. There is a vigorous development of the private economic sector. 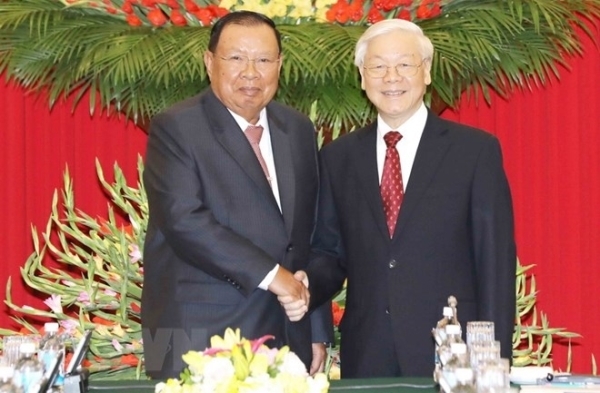 Concerning certain opinions about the repeat of the 10-year crisis cycle of Vietnam’s economy, Prime Minister Nguyen Xuan Phuc said that after having reviewed all elements, it is possible to assert that there is not any sign of the so-called crisis. The on-line meeting between the Government and localities is of important significance because it helps discuss, analyze and review the situation in the first 6 months of 2018. As a result, as reported by the General Department of Statistics, GDP in the first 6 months of 2018 is estimated to increase by 7.08% year on year, the highest since 2011./. On July 1, 2018, Facebook used the map called “Sansha” to show the Truong Sa and Hoang Sa archipelagoes under Vietnam’s sovereignty. This has caused grudges in society. 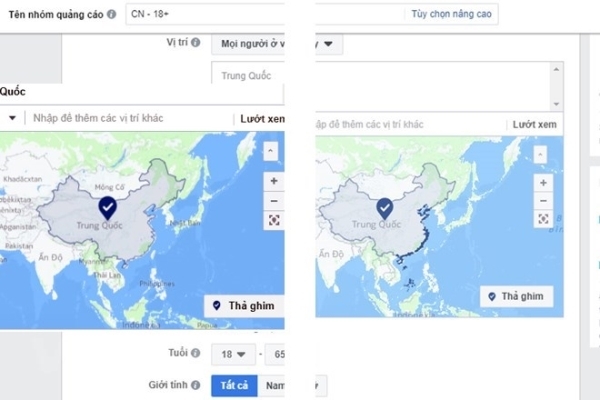 When selecting the object for advertisement, Facebook used the name “China” in the same blue color as the color of the Truong Sa and Hoang Sa archipelagoes. Within 24 hours, Facebook in Vietnam received massive criticism from the users’ community. Many users called on to boycott Facebook if this social networking site will not explain and apologize the users. In face of this situation, the Department of Radio-Television and Electronic Information (the Ministry of Information and Communications) immediately sent an official letter to Facebook, saying it has violated seriously the provisions of Clause 1, Article 5 of Resolution No. 72/2013/ND-CP on July 15, 2017 of the Prime Minister on management, supply and use of the Internet services and its information. As a result, Facebook is requested to correct immediately the mistakes, ensuring Vietnam’s sovereignty over these two archipelagoes. On July 5, 2018, Facebook apologized the users./. According to the survey of Nielsen, Vietnamese consumer confidence index has reached the highest level in the past decade. 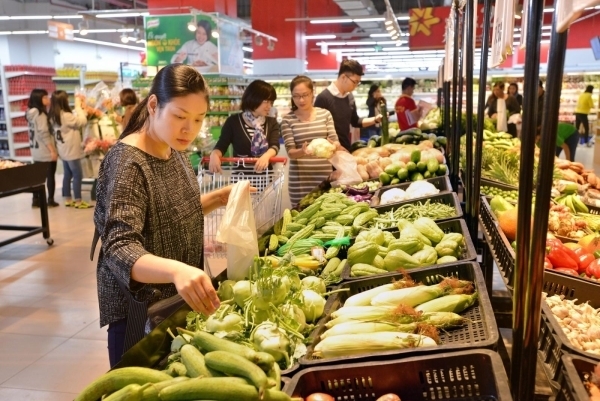 According to the latest data of the Conference Board and Nielsen, the current confidence index of the Vietnamese consumers is the highest in the past decade. This is attributed to the improvement of the confidence in the prospect of employment and private financial state. According to Nielsen, in general the Southeast Asian countries have the higher confidence index than those in the countries of the developed region. The positive psychology of the consumers in Vietnam, on the contrary, does not help to have vigorous growth of the fast moving consumer goods (FMCG)./. The temperature in Hanoi has gone beyond 40°C and will stay until July 6, 2018, whereas, in the central part of the country, it is 41°C. 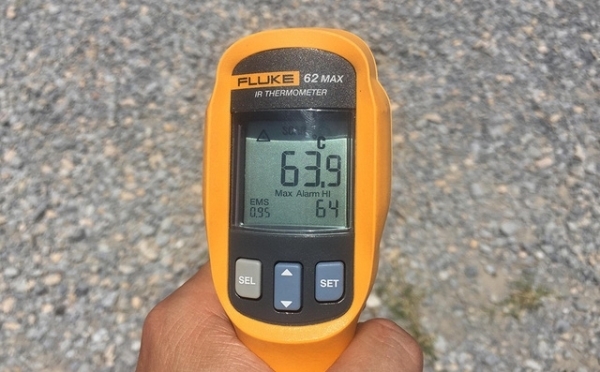 This is the most acute heat wave in the North of Vietnam. This has caused the high risk of forest fire. In the past few days, hospitals in Hanoi are packed with age-old patients and children, let alone, the people’s life has been badly influenced. Everything is in a mess./. On July 3, 2018, there was great fluctuation of USD rate over VND; so the State Bank of Vietnam immediately intervened. On July 3, the selling price of one US dollar was put at VND 23,050, a VND 244 reduction as compared to the listed price the day before. In the past two years, the State Bank of Vietnam has maintained the lower price than the ceiling price, about VND 20 to VND 50, depending on the stage. And so, after about half a month of fluctuation, the State Bank of Vietnam has taken strong action to stabilize the USD/VND price. 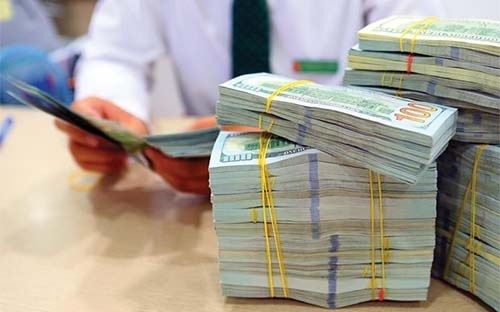 According to Governor of the State Bank of Vietnam Le Minh Hung, in the first half of the year, the Bank has bought USD 11 billion, hitting the foreign exchange reserve to USD 63.5 billion. The Bank has enough tool and resource to interfere to stabilize the rate and macro economy. As of July 3, the selling price of one US dollar was put at only VND 23, 070 after the peak rate at VND 23, 120./. Speaking at the Forum, Minister of Planning and Investment Nguyen Chi Dung pointed out that 2018 is the year to celebrate the 30th anniversary of foreign investment attraction and management in Vietnam. 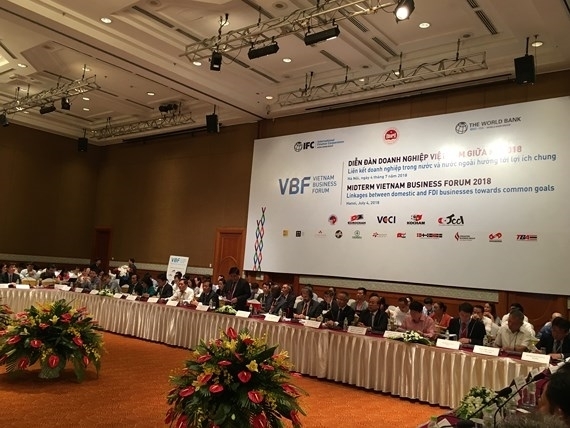 As of now, there are 128 countries and territories investing in Vietnam with about 26,000 FDI projects and the total registered capital of USD 326 billion, in which about USD 180 billion has been realized. However, the linkage between FDI and domestic enterprises is yet to live up to expectation and the development of support industry and technological transfer activities remain at low level. The co-host of the Forum were Minister of Planning and Investment Nguyen Chi Dung; Country Director of the World Bank in Vietnam Ousman Dione and Senior Country Director in charge of Vietnam, Laos and Cambodia of the International Financial Organization Kyle F. Kelhofe. With a series of reforms of the Government, especially in relation to export-import and investment, initial positive results have been made, creating confidence in the business community. To continue to attract and improve the skills of the work force, it is necessary for the Government to take action to modernize and improve the national educational system, particularly at the occupation schools and tertiary education./. Having received money from a reactionary organization, father and son Khanh have recently caused an explosion at Police State off Ward 12, Tan Binh District, Ho Chi Minh City. 8 suspects have been arrested and decided to be prosecuted. 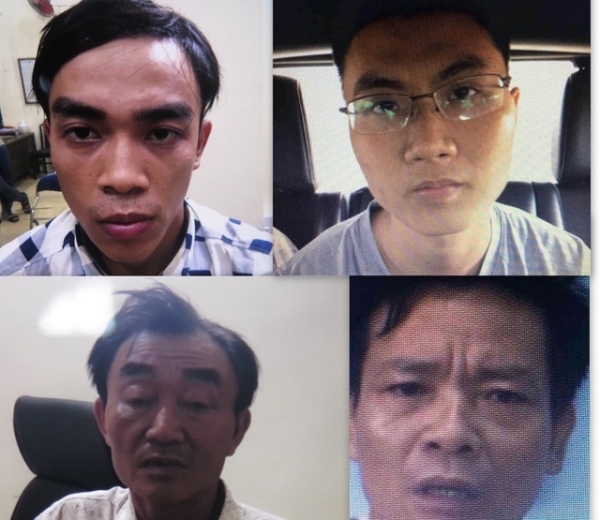 On July 5, 2018, the Police of Ho Chi Minh City prosecuted 5 culprits of terrorist attacks and 3 others for having illegal trading of explosives. On July 5, the Police of Ho Chi Minh City held a press conference to announce the initial investigation results of this law case./.